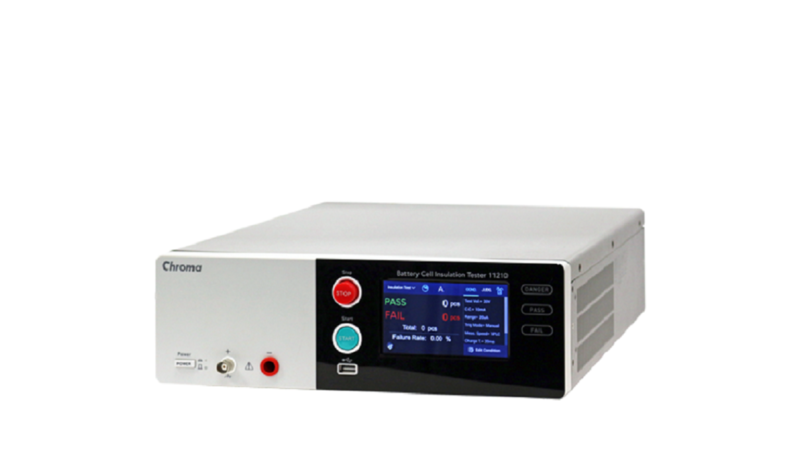 Chroma 11210 battery cell insulation tester is an instrument used for accurately measuring leakage current (LC) and insulation resistance (IR) of battery jelly-roll/dry-cell as well as various insulation materials. In addition to standard LC/IR measurement, the 11210 has a unique function that detects partial discharge (PD) or flashover that may have occurred inside the insulation material during the high voltage insulation testing process. With PD detection of the battery&apos;s internal status before electrolyte filling, defective products can be filtered out before entering the next stage of production preventing the potential hazards that may occur in the field. In contrast to traditional methods of insulation test, Chroma 11210 provides an entirely new concept for inspection and evaluation of battery quality.